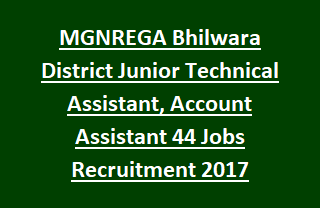 MGNREGA Rajasthan Bhilwara Dist Recruitment 2017: MGNREGA, Bhilwara District has given notification for the engagement of candidates for Junior Technical Assistant, Account Assistant Jobs. Total no of posts available in MGNREGA Bhilwara District Recruitment are 143 posts. Current recruitment notification has released on 02-11-2017. Candidates who are interested for this MGNREGA Rajasthan Recruitment can go through the official website www.Bhilwara.rajasthan.gov.in. Fill the application and submit before 30-11-2017. Age of the candidates should be 21 years to 35 years. Educational qualifications required for Jr. Technical Assistant Posts is BE/ B. Tech in Agriculture Engineering or Degree/ Diploma in Civil Engineering. Candidate selection for the recruitment of MGNREGA Junior Technical Assistant Jobs is based on written exam/ Interview. Application fee for general/ OBC candidates is Rs. 100/- and for SC/ST candidates is Nil. After the recruitment process Candidates will be offered Rs. 13,000/- per month for Jr. Technical Assistant Posts and Rs. 8000/- per month for Account Assistant Posts. For more application procedure details, Selection Process, Pay Scale, Age limits, Relaxation in Age and other information of MGNREGA Bhilwara District, Rajasthan Recruitment of Junior Technical Assistant, Account Assistant Jobs are given below. Total no of vacancies available in MGNREGA Bhilwara District Recruitment are 44 posts. Total No of Posts: 44. 1. Jr Technical Assistant: 22 posts. 2. Account Assistant: 22 posts. Jr Technical Assistant: BE/ B. Tech in Agriculture Engineering or Degree/ Diploma in Civil Engineering. Account Assistant: B.Com/ CA. Intermediate (IPC)/ ICWA (Inter)/ Company Secretary (Inter) from recognized University. Minimum age limit is 21 years and maximum age limit is 35 posts. Pay Scale for Jr. Technical Asst posts is Rs. 13,000/- per month. Pay scale for Account Assistant posts is Rs. 8000/- per month. MGNREGA Bhilwara District Recruitment selection is based on candidate merit in written exam/ Interview. Application fee for general and OBC candidates is Rs. 100/- and no application fee for SC/ ST.
Qualified/ Interested candidates can apply for Account Assistant, Jr. Technical Assistant Jobs using the official website www.Bhilwara.rajasthan.gov.in. Check the notification for instructions to fill the application. MGNREGA Rajasthan Recruitment Application submission last date is 30-11-2017.